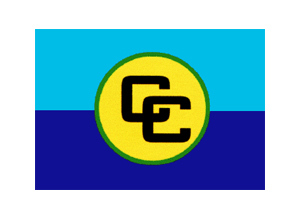 The logo of the Caribbean Communityconsists of two interlocking C's. The two C's are in the form of broken links in a chain, symbolising both unity and the break with our colonial past. The Standard of the Caribbean Community features a blue background - the upper part being of a light blue representing the sky and the lower part of a dark blue representing the Caribbean Sea. The yellow circle in the centre of the Standard represents the sun on which is printed in black, the logo of the Caribbean Community - two interlocking Cs. The two Cs are in the form of broken links in a chain, symbolising both unity and the break with our colonial past. The narrow ring of green around the sun represents the vegetation of the Region. The Fourth Conference of Heads of Government Meeting in Port-of-Spain, Trinidad and Tobago, in July 1983, approved the design of the CARICOM Standard. The original design was done by the firm of WINART Studies in Georgetown, Guyana. The CARICOM Standard was flown for the first time at the Fifth Conference of Heads of Government Meeting in Nassau, The Bahamas, in July, 1984.”. 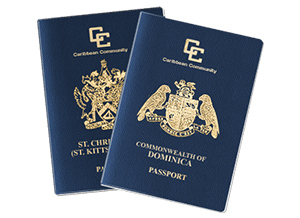 A CARICOM passport, which features the CARICOM logo and the words “Caribbean Community” printed on the cover, is a National passport which is issued in accordance with agreed common colours and format for intra-regional and extra-regional travel. The Coat of Arms and the name of the Member State are also featured on the cover. The issuance of the CARICOM passport was agreed to by Heads of Government and the document is seen as a defining symbol of regionalism.It is part of the measures to promote hassle-free travel for CARICOM nationals. The first CARICOM passport was issued on 7 January 2005. Todate, except for The Bahamas, Haiti and Montserrat, all other Member States have issued.